I’ve experimented with coconut milk, blended tofu, and soy milk variations. But the best vegan raita is easiest to make with soy yogurt. You may have noticed The Lotus and the Artichoke doesn’t feature a lot of vegan special ingredients and store-bought processed items, but this is one exception. I want everyone, anywhere to be able to make the majority of these recipes without the luxury or industry of city-based specialty organic and vegetarian supermarkets. But sometimes it’s fun to take advantage of the great vegan alternatives we should know to appreciate. If you’re out in the country or otherwise don’t have access to fancy store bought vegan items, please share your experiences and suggestions on how to keep things vegan and interesting! Peel, dice cucumber in very small pieces. Put in bowl and refrigerate. Peel, dice potatoes in small cubes (1/2 in / 1 cm). Heat oil in a large frying pan on medium high. Add mustard seeds. After they start to pop (30-60 sec), add cumin, coriander, paprika, hing. Mix, fry for 1 min. Add potatoes, turmeric. Fry well, stirring regularly, 8-10 min. Sprinkle with water every few min, partially cover to speed thorough cooking. Adjust heat as needed. 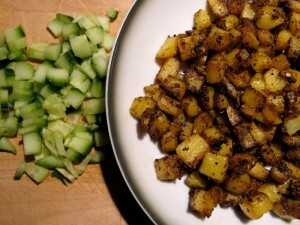 Potatoes should be well cooked, crispy but not burnt. Turn off heat, transfer potatoes to bowl, add salt, mix. Cool uncovered for 10 min. Put in fridge, cool another 10 min. 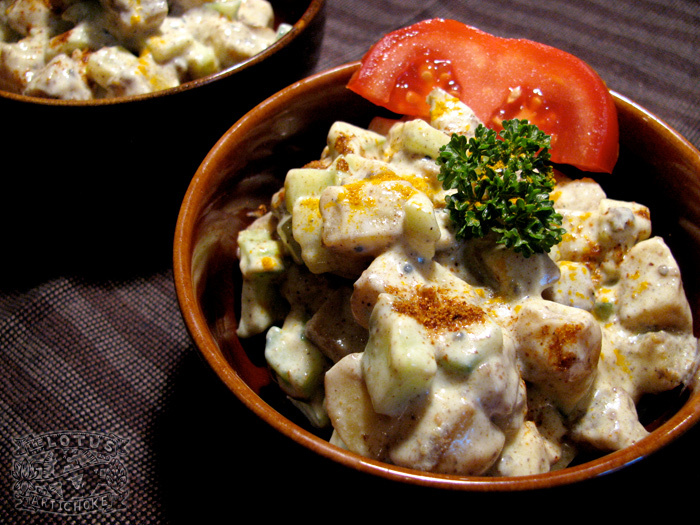 In a large bowl combine potatoes, cucumbers, soy yogurt. Mix gently, but well. Garnish with sprinkled paprika, pinch of turmeric, parsley, and tomato slice. Add 1/2 tspn garam masala and/or 1/2 tspn amchoor powder for more flavor. Increase turmeric for more yellow color. Fancy a wild, pink raita? Replace one potato with red beet (prep, cook same as above), add one chopped raw tomato at the end. This entry was posted in Indian, North Indian and tagged appetizer, cucumber, north indian, potatoes, raita, recipe, starter, vegan. Bookmark the permalink.